Best HEVC Decoder Helps Play HEVC/H.265 Videos on TV, PC, Mac, Android, iPhone, etc. Free download HEVC software decoder for Windows (10) and learn how to decode HEVC/H.265 videos. 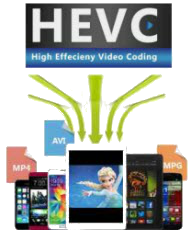 HEVC, short for High Efficiency Video Coding and also known as H.265, is an advanced video compression standard initially published in 2013. Compared with its predecessor AVC (H.264), HEVC can compress videos to smaller size while keeping the same video quality. Therefore, most people actively convert videos to HEVC to save disk space. However, there're still many hardware devices arriving without built-in HEVC decoder such as Apple TV and Google Chromecast, which makes HEVC video playback become a knotty problem. Below are two examples. "I have some movies with HEVC (h265) compression. I'd like to play them from USB disk on TV that doesn't support that format. It's 2013 model Samsung h7150." "My computer (Intel i5-3570K, HD Graphics 4000) does not support H.265. How can I play videos with H.265 codec?" To solve such kind of issues, we can download a piece of HEVC decoder software to convert HEVC videos to other formats compatible with our devices. Best HEVC Decoder for Windows 10, 8.1/8, 7, etc. 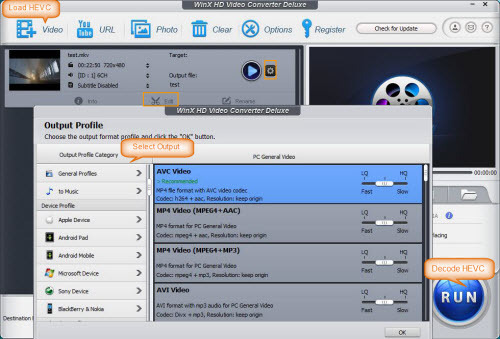 WinX HD Video Converter Deluxe is the right one. It enables you to decode 8K/4K UHD/HD HEVC (H.265) videos to MP4, AAC/H.264, AVI, WMV, MOV, FLV, or other formats at super fast speed without obvious loss of quality. Moreover, it has 410+ optimized profiles for all popular devices including smartphones, tablets, game consoles, and TVs from Apple, Microsoft, Google, Amazon, Samsung, Sony, etc. By the way, it is also a HEVC encoder. Purchase now and save big! How to Convert HEVC to Other Format on Windows (10) with WinX HEVC Decoder? To get started, you need to download HEVC decoder on your computer and install it following onscreen instructions. Both Windows and Mac version are lightweight and easy to set up. Afterwards, you're supposed to follow the steps below to decode HEVC for playback on Google Chromecast, Apple TV, Roku, Amazon Fire TV, Xbox, iPhone, Android, or other gadgets. Step 1. Load source videos encoded in HEVC. Open the HEVC/H.265 decoder, move your mouse onto "+ Video" button and click it. Then, you're asked to browse and select target HEVC videos. It is available to load multiple files at once. You can choose any output profile you like form the auto pop-up Output Profile window. - Tap on gear-like icon if you need to adjust video audio parameters, such as bit rate, frame rate, sample rate, aspect ratio and video resolution. Step 4. Begin converting HEVC to desired type. Press the blue "RUN" button to command this HEVC decoder to begin working right now. You will see a new panel showing up with a progress bar. HEVC decoding won't take too much time, because this video converter combines several cutting-edge technologies together to boost video transcoding speed, Intel QSV and NVIDIA (CUDA) NVENC based hardware acceleration, Multi-core CPU, Hyper-threading, and Super Encode Engine based on MMX-SSE & AMD 3DNow!, respectively. Further Reading: Which Hardware Supports HEVC? In addition to capitalizing on HEVC decoder software to realize smooth HEVC playback, we can also upgrade hardware to achieve the goal (of course, it costs more). 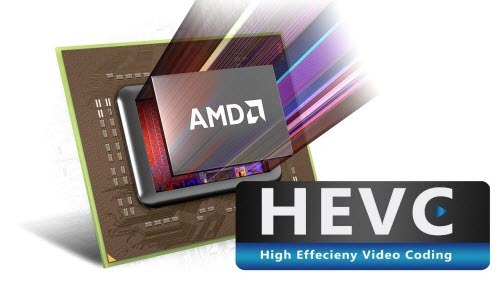 Below is a list of famous desktop and mobile hardware which supports HEVC playback. ● Qualcomm Snapdragon 805/615/410/208 SoCs or newer. Support ranges from 720p decoding on low-end parts to 4K playback on high-end parts. ● Makes photo slideshow videos with customized background music.